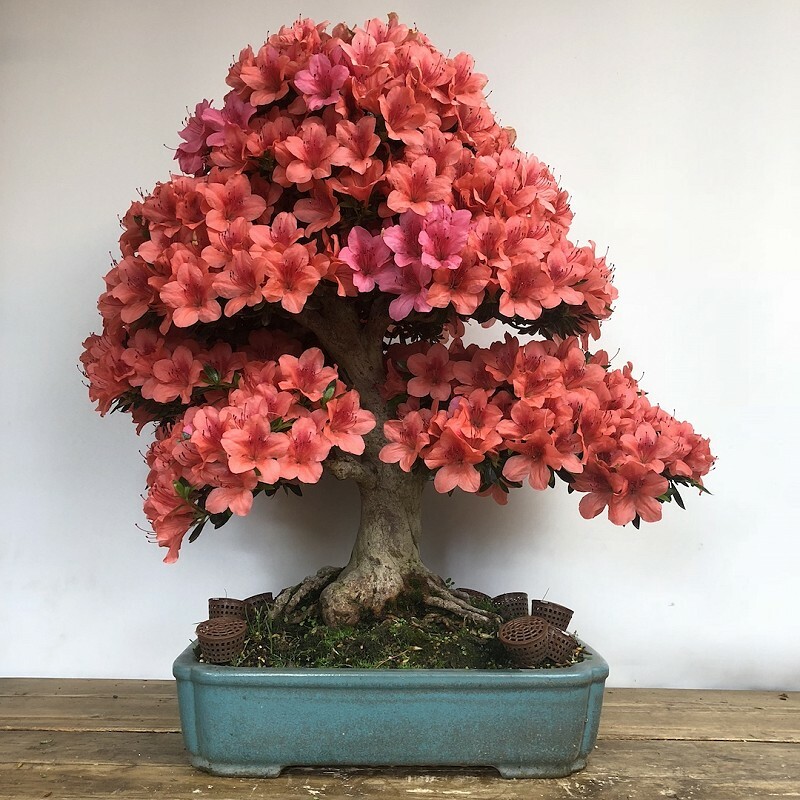 So its that wonderful time of year when the Satsuki Azaleas are just beginning to finish flowering and they need their post flowering pruning. Some here are still opening up, some are completely finished and a lot of the repotted ones should have had their flowers removed a week or so ago. The basic idea with post flowering pruning is to remove the flower, the most likely pollinated ovary and then also prune, thin out and style. Removal of older lignified twigs is an essential part of keeping satsuki azalea strong and people may think that it is a brutal pruning, especially if you see me attack them with a pair of spring loaded hedge shears. There is a certain amount of rough work that is done but that is always followed up by detailed pruning to ensure correct branch structure, bifurcation and more importantly looking to remove older twigs and secondary branches before they make the tree inefficient and old. If you think that its brutal and the wrong thing to do, then enjoy watching your satsuki slowly die while the rest of us enjoy ours. For a full discussion of this see you should do a workshop with me on them or watch the live stream from Mirai Live from around this time last year. 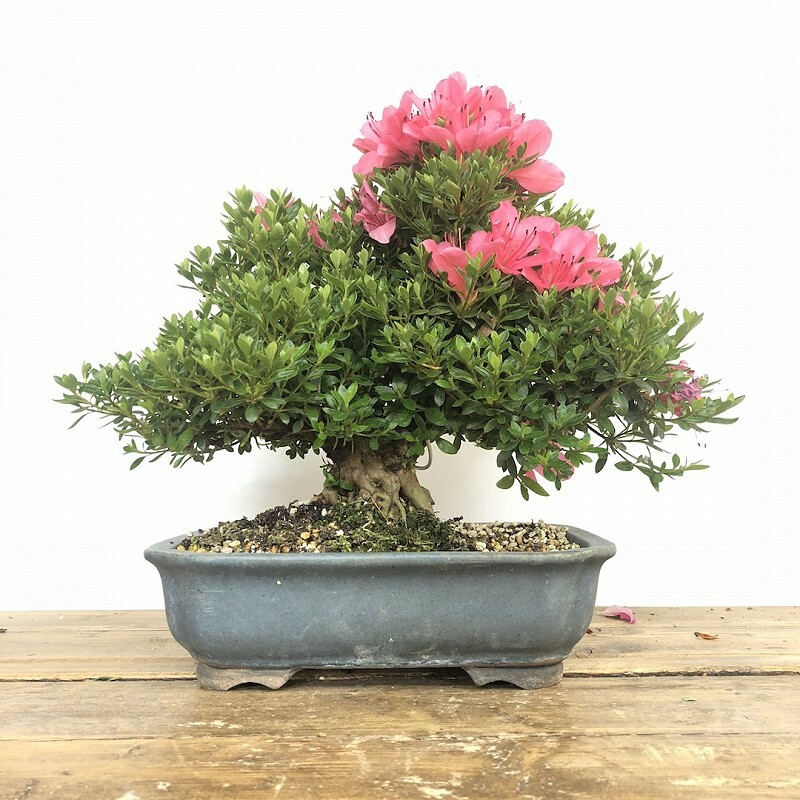 This concept is fundamental to all bonsai but more so to Azaleas. 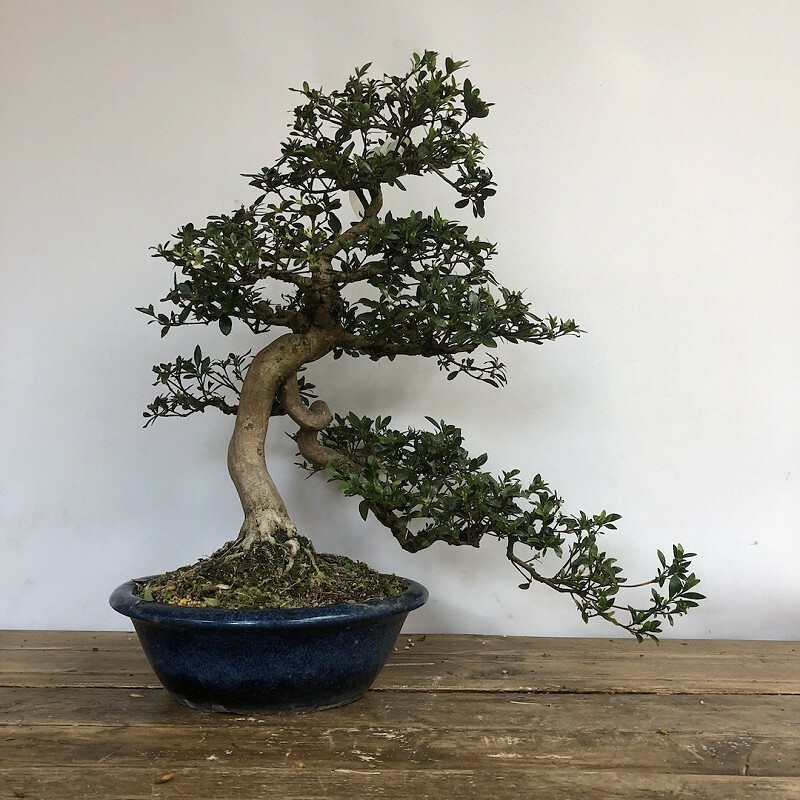 Styling them here at Saruyama is a case of allowing some areas to grow more than others, pruning to shape, a bit of wire when necessary but not too much. As most of them will be going on for sale at some point, although I couldn’t give them away at the Heathrow show, then there needs to be some work left for enthusiasts to do. Even the ones I want to keep around for a while I still take a minimal wiring approach because wire damage can occur quickly with quick growing species. 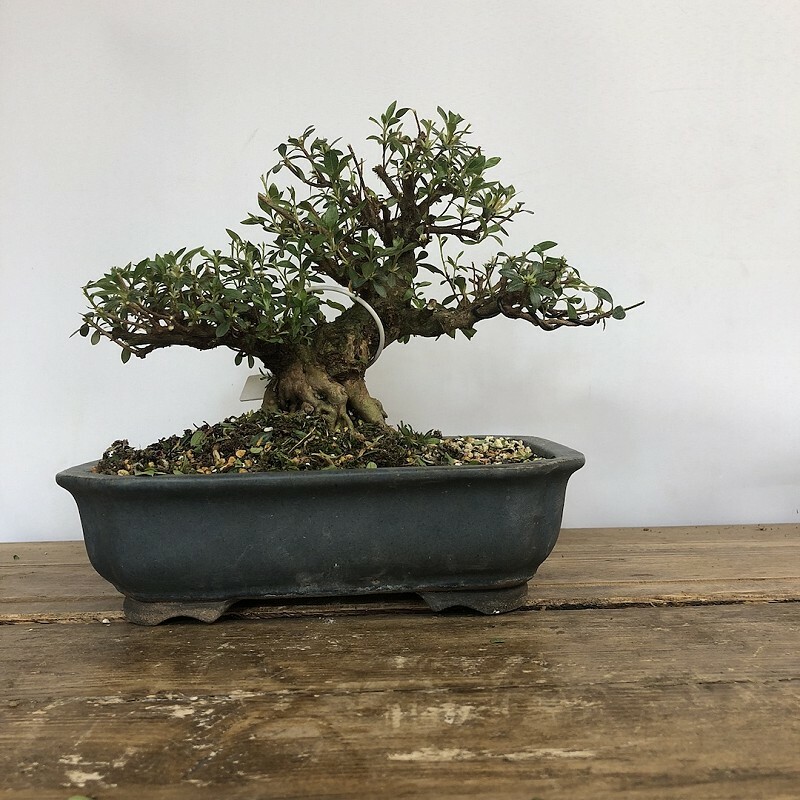 Akemi-no-Tsuki, shohin sized and planted in a John Pitt pot. 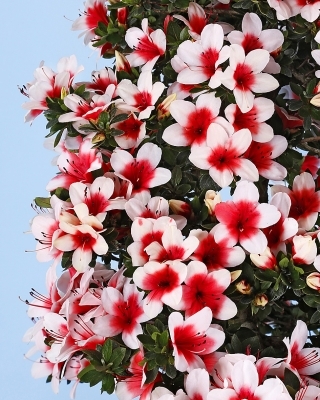 Akemi-chan is one of the most beautiful flowering varieties with delicate pink, white and mixed white pink flowers that are small for an azalea. 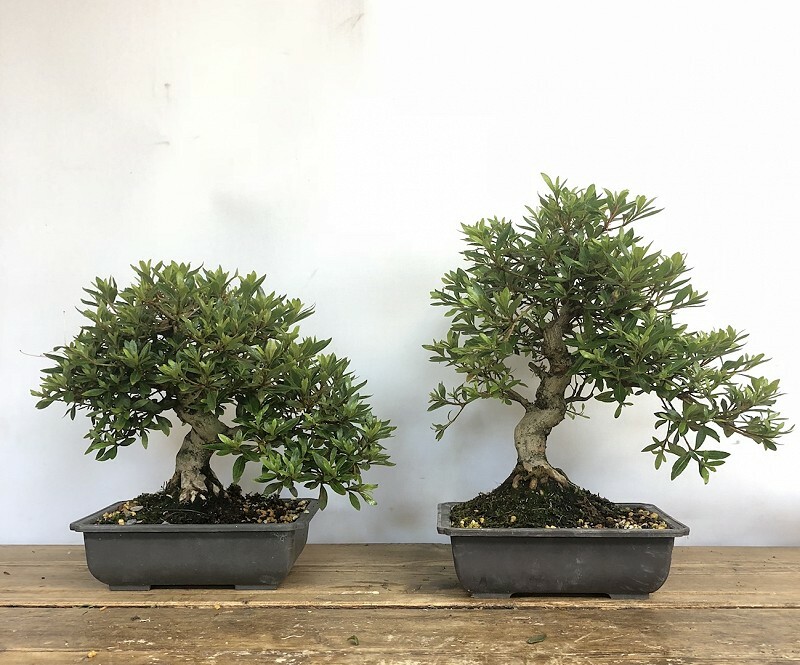 Her best feature though is the naturally dense and compact foliage growth as well as the ability to put on a thick base., making it ideal for shohin sized trees. The before picture here has hundreds of shoots growing out from the trunk to make the silhouette, which is not the most ideal way of growing them. As a result it was cut back hard and a lot of trunk shoots and growth from the base of branches was removed to re-simplify the shape. I am looking to grow out the right-hand side in the future to develop a definite character branch, whilst keep the rest in check. I was very happy to pick this one up last year and hope to have her a bit longer than the last one which has now turned into one of the biggest regrets of my short career. Next up we have another variety that is in my top 5 and one that was lucky enough to get a nice pot this spring. Yata-no-kagami planted in an Antique Namako glazed round pot. Yata have lovely pinky red flowers with white mixed in with them, although this one has gone mainly pink. Their leaves are relatively small and the growth habit isn’t too bad, but never usually as dense as some others. Some nice autumnal colours as well. One issue is they do have incredibly fine roots compared to other varieties so this one needs transplanting more frequently. I liked the rule breaking branch on this one, coming from the inside of a curve, doing a full loop. Unusually the apex is much more vigorous than the lower branch which I have been trying to strengthen and grow out. This meant that the top got pruned much harder back, however the neck is still a bit too thin, so I am not too concerned with the fine details of the branching until the top section of the trunk has thickened and the slight wire scars have grown out. Pair of Shohin Hinomaru. Not too much experience with this variety but it from the Nikko family and so it has a very similar growth habit, compact, tight, vigorous and small leaved. Easy for beginners to work with and results can be achieved quite quickly. The branches thicken relatively quickly and that is the stage we are at with both these two trees. Branch selection was made earlier in the year, remaining branches are to be lengthened/thickened appropriately, then fine structure. 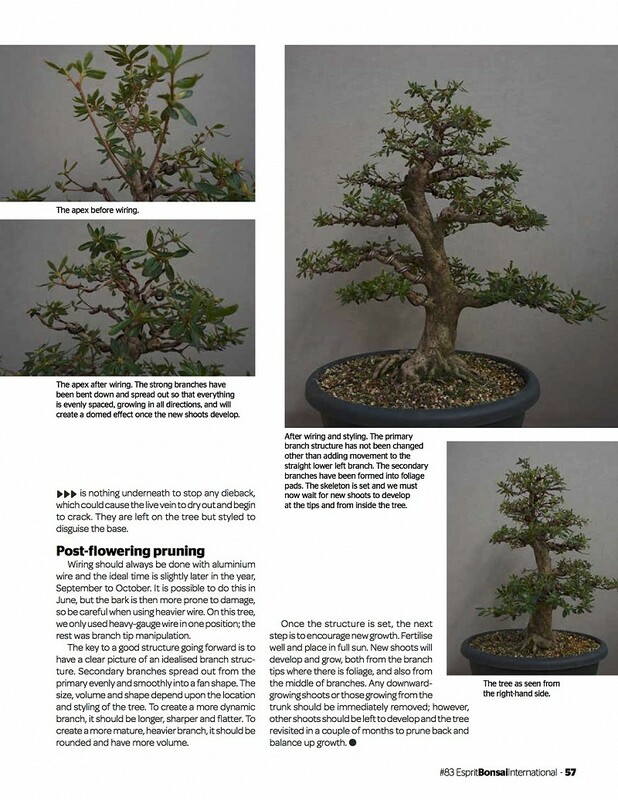 Finally we have this Osakazuki which has featured in several articles for Esprit Bonsai. It has come on leaps and bounds since it was worked on, and the flowers have a few more days left on them so I will enjoy it for a wee while longer. 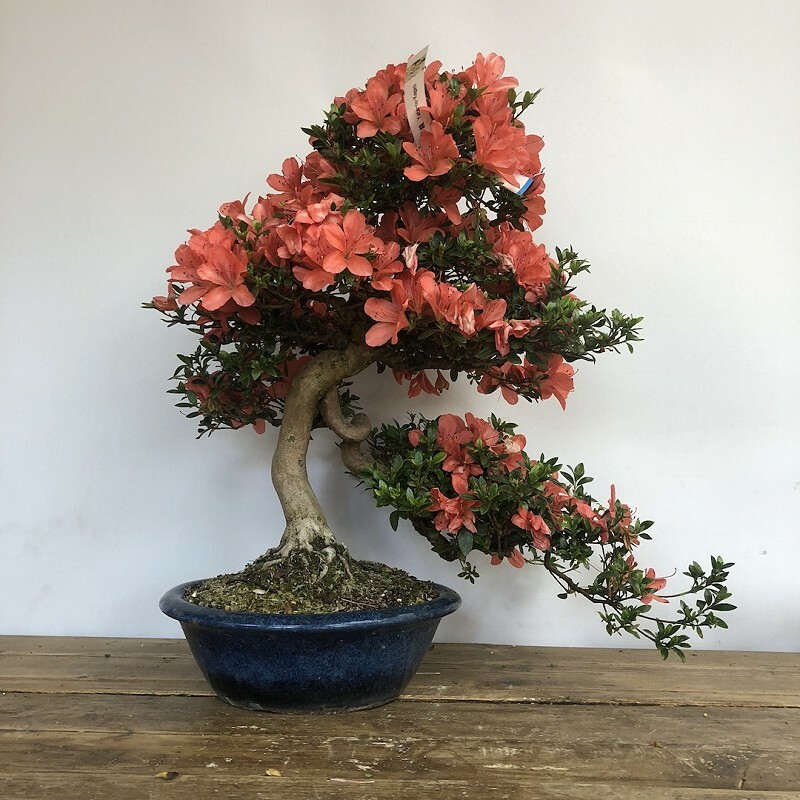 Satsuki are fun and relatively easy bonsai to work with, as long as your horticulture is down. Lots of water, lots of food, know how to repot and prune properly and they go gangbusters. Nice post! Thanks :) I wanna buy both those Hinomaru! Do you ship to Sweden?